You may have read our previous article on purifying water and have an understanding that boiling water for the right amount of time will make most water safe enough to drink. While bringing water to its boiling point is enough to sterilize the liquid and kill water-born pathogens and bacteria, doing so will not remove the mineral impurities that are found in most sources. Distilling water solves this problem and unlike boiling, allows for the removal of potentially dangerous mineral contents. As the water boils, the chemicals inside are separated as they reach their own lower boiling points. These chemicals are collected and discarded, resulting in distilled water with a much higher purity. In addition to eliminating bacteria and viruses, the distillation process removes metallic minerals, salts, and other particles that may be harmful to the body. Distilled water is used for a variety of reasons in normal times. The lack of minerals in water that’s distilled makes for a less-corrosive solution, hence why it’s often used in automotive cooling systems. Distilled water is also used in fish tanks and aquariums, as it lacks the chemicals often found in tap water that may be harmful to aquatic ecosystems. People often favor distilled water for use in steam irons and steam mops to prevent damaging clothing, upholstery, and flooring with potentially harmful minerals. Cigar humidors and humidifiers used in acoustic guitars and other stringed instruments also employ the use of distilled water for increased effectiveness. Since minerals are removed from the water, distilling water found from wild sources could be safer to drink than water that is simply boiled or purified with a chemical agent. This could become necessary in a SHTF or wilderness survival situation, as some water sources are simply not safe enough to drink without some kind of treatment. This is especially true in arid regions close to the sea that often lack sufficient freshwater sources, where desalination is used to make seawater drinkable. This also applies to the aftermath of natural disasters, when city services are often interrupted and raw sewage and other bacteria-ridden water sources could mix with your drinking supply. Start by filling the pot about half of the way with the water you’d like to distill. Turn the stove on to a temperature that will induce boiling. Place glass bowl in the center of the pot so it’s floating in the center or suspended using a wire rack or other instrument. Make sure the bowl does not touch the bottom of the pot, or the distilled water collected will re-boil. Place the lid on the top of the pot upside down so it curves inwards towards the bottom of the pot. Fill curved lid with ice cubes, ice packs, or a cold, wet towel. As the water boils and evaporates, steam particles will collect on the underside of the lid. With the lid cooled down by ice, the steam will condense back into a liquid and run to the lowest point of the lid before dripping into the glass bowl. The process can be repeated until the bowl is filled or comes too close to the bottom of the pot. Another slightly more complicated at-home method involves using two glass bottles and a similar distillation process. Start by filling one bottle with water then connecting the openings of both bottles with some kind of glass or copper coupling. Place the water-filled bottle into the pot of boiling water and the other in ice or wrapped with a cold cloth. As the water inside the bottle evaporates, the steam will flow into the chilled empty bottle and condense back into water. This can be tricky, as the bottles must be connected and angled at such a degree to prevent the collected distilled water from flowing back into the first bottle. The above two-bottle method can also be conducted outdoors. Instead of using a stove top heating element and ice-chilled collection container, the bottles are simply connected and left to sit outside, one in the sun and one in the shade (or buried in the dirt or covered in something cold and wet. Over time, the water in the sun bottle will evaporate and collect in empty shade bottle, where it is cooled back into a liquid. Again, make sure your bottles are angled appropriately to prevent cross contamination of the two liquids. Also keep in mind that this process requires direct heat from the sun and may take a long time to distill a small amount of water. 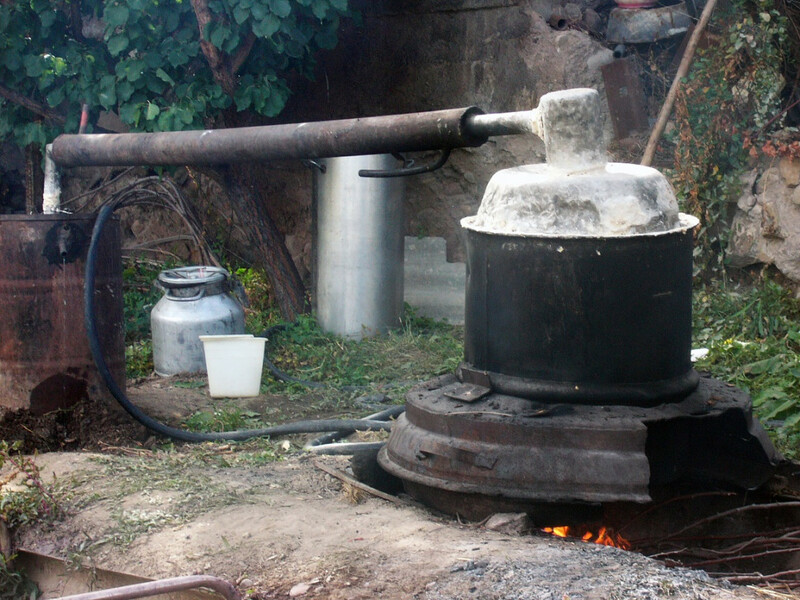 Solar stills are another effective way to distill water outside. They are often found amongst the survival supplies on military aircraft and ship’s lifeboats as means to distill seawater for drinking. The process can also be done from the ground in areas with high moisture, like wet soil and plants. For the ground method, a hole is usually dug in the ground and covered with a clear plastic sheet anchored on the sides with rocks or other debris. A small weight is placed on top of the sheet in the center to create a slight depression. The moisture from the ground evaporates and vapor collects on the cool underside of the plastic sheet where it drips down from the weighted point into a collection jar (buried to assist in condensation). You can also use a plant or shrub and a transpiration bag to distill water naturally. A simple plastic bag covers a stemmed plant with one corner pointing down to collect the condensation. The same process applies, as the moisture from the plant evaporates to the top of the bag before falling into the collection point. The corner can either be emptied periodically, or you can make a small incision so the water drips into a cup. For the transpiration bag to work, the plant must be in direct sunlight for an extended period of time. The seawater still was created in 1952 by the United States military for downed pilots stranded on the ocean. The system uses an inflatable plastic orb that floats on the sea. The inner trough is filled with seawater, which evaporates and condenses before falling into an inner trough within the orb. A separate plastic container hangs from the side and collects the distilled water, which can then be consumed through a small straw. On a good day with lots of sun, upwards of 2.5 quarts of purified water can be collected using this method. In essence, nature creates its own distilled water through evaporation and precipitation. As water evaporates from the earth it leaves most of its mineral impurities behind. It then condenses in the cool air of the clouds before precipitating back to earth. Theoretically, this rainwater is distilled and can be collected for drinking in clean container. The lid should be secured and the water left to sit for 2 days to allow any remaining minerals to settle, but otherwise the surface water is safe for drinking. Keep in mind that as rain falls it is capable of collecting trace amounts of dust, atmospheric gases, and nitrates, but is generally mineral-free. The simple answer is yes; distilled water is safe to drink. With all of its mineral impurities removed, distilled water is H20 in its purest form. The disadvantage is that the majority of the natural minerals found in the water are eliminated, some of which are desirable for your overall health–calcium, magnesium, iron, etc. In this case, distilled water may be inferior to well, spring, or rain water. Distilled water purchased at the grocery store is derived from drinking water, so it is safe to drink or use. However, water distilled from an industrial or contaminated water supply may not eliminate every impurity and may be unsafe for human consumption. Water distilled at home may also be become contaminated if improper equipment–which may leach dangerous chemicals–is used in the process, so be sure your containers and equipment are thoroughly cleaned and of a suitable material. Though the process is time-consuming, distilling your own water is convenient, money saving, healthy, and great for emergency situations. Distilled water should not be relied upon as your primary drinking source, but the knowing how to make it could save your life in the event of a crisis. Can You Eat Canned Dog Food to Survive? « Really Scary – Is this the end of humanity?